Honolulu motorcycle police officer Steve Favela was one of five officers President Bush honored by name yesterday during this year's National Peace Officers Memorial Service on the grounds of the nation's Capitol. "His death is a reminder of the daily risks that each officer assumes," Bush said in a speech during the service. 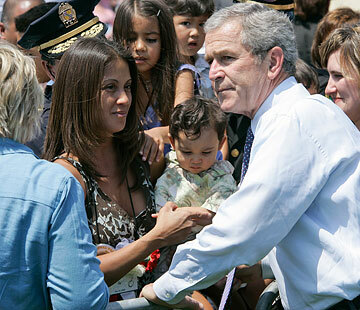 Bush said he and first lady Laura Bush shared the grief of Favela's family after the officer died from injuries he suffered while escorting the presidential motorcade at Hickam Air Force Base in November. "I was very touched that he remembered Steve in his address," said widow Barbara Favela. "I did get to speak with President Bush, and he was very sincere in his comments to me." After his eight-minute speech, Bush left the stage overlooking Capitol Mall and spent the next two and a half hours greeting and speaking with the families of the law enforcement officers who died in the line of duty last year. He even leaned over the metal barricade and exchanged kisses with Favela's 6-year-old daughter, Kiana. Steve Favela, 30, an eight-year veteran of the Honolulu Police Department, also left behind three sons, ages 8, 3 and 9 months. The three boys, their sister and mother made the trip to Washington for the memorial service, courtesy of HPD. Honolulu Police Chief Boisse Correa and Deputy Chief Glen Kajiyama also attended yesterday's service. Correa expressed his appreciation and gratitude to Favela's parents, whom HPD also invited but were not able to attend. Bush was on a 16-hour stopover in Hawaii when Favela crashed his motorcycle Nov. 21. Favela died five days later. The cause of the crash is still under investigation. Yesterday's service, the 26th annual tribute, honored 147 federal, state and local law enforcement officers who died in the line of duty last year. Bush has attended every service during his presidency.